This article assumes the reader is familiar with applying 8-bit masks to image holes in order to create a vignette. If this is not the case the reader should consult article Applying a mask to an image hole. Recall from the above article that a mask merely makes part of the image either totally or partially transparent while leaving the remainder opaque. The example below illustrates this. 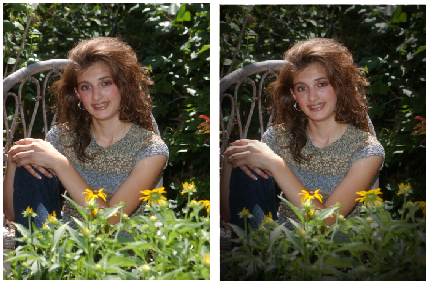 The image on the right has had a mask applied to make the edges partially transparent. 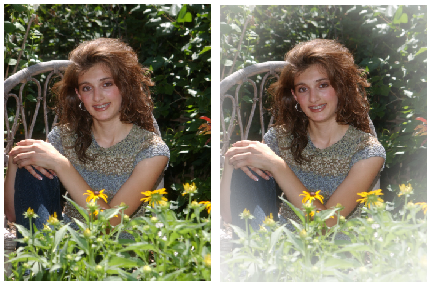 To achieve a dark vignette it is then simply a matter of placing a black or dark graphic behind the image hole on the template. Since the edges of the second image are partially transparent the black graphic will be partially visible darkenning the edges as illustrated below. The user is encouraged to experiment with different masks and different coloured background graphics to achieve a range of effects. The mask used above together with other masks are available for you to download. You are free to use these masks in any way you please. The following movie tutorial may also be useful in relation to this topic.